After the evacuation from Dunkirk in early June 1940, the German armies were barely thirty miles away across the English Channel. It was widely believed that an invasion would swiftly follow, either in July or August. Although the British public put their faith in the Home Guard to defend their country, an organisation so secret that information about it has only recently been made public was also ready to act. With their motto "Ready to serve if called" the Auxiliary Units were trained and waiting. Their origins are described in the History of the Auxiliary Units, and then read the personal memories of a member of what he describes as the Bath Resistance Movement. During 1940 and 1941, the German air force had concentrated on bombing targets that they thought would most hinder the British war effort. Around Bath were several such targets. The Bristol docks were repeatedly attacked, to hamper the import of weapons and equipment. The airfield and factories to the north of Bristol manufactured aeroplanes and so was another prime target, as was the airfield at Westonzoyland in Somerset. Colerne too was attacked. Further away, the Gloucester docks, and the factories in Birmingham and its surrounding areas were also targets, and for German planes based in France, the usual route to them was across Somerset or Wiltshire. The residents of Bath had become accustomed to seeing German planes flying over Bath. Whenever German planes were in the area, the air raid warning would sound, but almost every time, the planes simply flew on until the reached the area beyond Bath which was their target for that raid. Diaries kept by Bath residents also recorded the occasional stray bombs in Batheaston and Newton St Loe. In April 1940, a single bomb was dropped on High Common, near Sion Hill. One person was slightly injured. In August 1940, 56 incendiary bombs were dropped between Wellsway and Newbridge Hill. Five fires broke out: four in Oldfield Park and one in Kelston Road. In September 1940, five bombs exploded in Twerton, and incendiaries caused fires at Bath City Football Ground and in Newbridge Road. Three days later seven bombs fell in the Lower Weston area. In the early years of the war, German bombs were not very reliable, and it was fairly common for some to fail to explode. It is unusual that none of the ones dropped in December exploded though, and it is likely that the plane was flying so low that the bombs reached the ground before the detonator had time to arm itself ready to set off the explosive. Later in the war, design improvements meant that bombs could be released reliably much nearer the ground than had been possible before. In November 1940, another eight bombs fell in the Lower Weston area. Two of them did not explode. 25 incendiaries were dropped between Julian Road and Walcot Street, causing 13 separate fires. In December 1940, nine bombs fell in the Locksbrook area. None of them exploded. After being made safe, these bombs were put on display in the Parade Gardens as a reminder to residents of why it was important to comply with the blackout regulations. In January 1941, 50 incendiaries fell in the Odd Down area causing 12 separate fires. Two weeks later, two bombs fell in Twerton, two others fell nearby on the Lower Bristol Road, and one on the other side of the river, in Locksbrook. Six people were killed including three evacuee children from London, and 26 were injured, 6 seriously. On the same day, 100 incendiaries were dropped between Twerton and Englishcombe, but only caused minor damage. In April 1941, five bombs fell in the Dolmeads area of Widcombe. As the picture below shows, they caused a substantial amount of damage in Broadway, Princes Buildings, Archway Street and in Excelsior Street. 11 people were killed, 9 were seriously injured, and 43 were slightly injured. During the year (April 1940 to April 1941) when these air raids on Bath took place, there were many other occasions, at times more than once in a day, when planes flew over Bath taking their bombs elsewhere. The planes that did bomb Bath were thought to have been heading for Bristol or Gloucester, and mistakenly bombed Bath because of navigation errors. Because of this, the residents of Bath did not expect an air raid warning to indicate that Bath was particularly at risk. Although some played safe and took to the air raid shelters whenever the warning sounded, a considerable number of Bath residents had discovered that they had been spending the nights in cold, damp air raid shelters when they would have been safe in their own beds, and they became accustomed to using the shelters only if they heard explosions. For a small number of residents in Twerton and Widcombe in 1941, this proved fatal. Nevertheless, most people thought that apart from the occasional stray bomb, Bath was safe. Between 13th April 1941 and 24th April 1942, no bombs fell on Bath, which reinforced that view. During that time Bristol had suffered frequent attacks, and much of Bristol lay in ruins from repeated bombardments by planes that had flown over Bath to get to Bristol, and each time the sirens sounded in Bath warning of enemy planes approaching Bath. 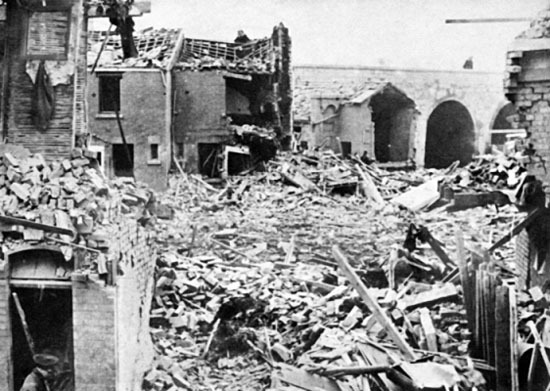 Thus, when the evening of 25th April 1942 arrived and Bath was the target of a major attack, the residents of Bath had experienced a whole year without a bomb falling. Many Bath residents were ignoring the air raid warning siren until the first bombs exploded, assuming that it was another false alarm. Only when it became apparent that Bath was the target, did they seek shelter. Some lost their lives as a result. NFS records show that the headquarters of D Division was set up in number 3 Royal Crescent on 17th November 1941. The National Fire Service came into being in August 1941. Before that Britain had more than 1000 independent local fire services manned by Auxiliary Fire Service personnel, each with its own command structure and choice of equipment. The NFS was intended to be a national force with standardised equipment and training, controlled centrally and divided into geographical regions. Bath and surrounding areas became Region D of Fire Force 17. Fire Force 17 covered Gloucestershire, Bristol, North Somerset and Wiltshire. The National Auxiliary Fire Service (which is what the Fire Brigade was called at the time) was caught unawares by the Bath Blitz. It had become accustomed to sending fire engines to assist whenever Bristol was attacked. Thus when the air raid warning sounded on 25th April 1942, a fire appliance and crew from Bear Flat was dispatched to Bristol, only to discover that on this occasion, a whole year after the previous bombs that fell on Bath, they were needed in Bath and not Bristol. A member of the fire crew on that fire engine remembered it clearly.